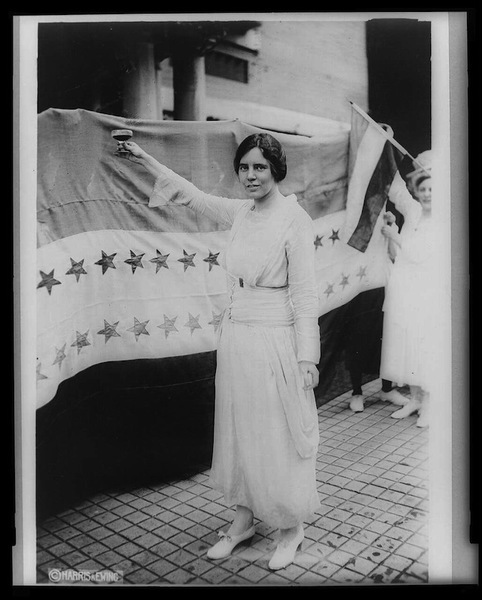 Alice Paul, “Alice Paul,” Histories of the National Mall, accessed April 23, 2019, http://mallhistory.org/items/show/79. Activist and leader of the National Woman's Party, Alice Paul organized the Woman Suffrage Parade on Pennsylvania Avenue the day before Woodrow Wilson's inauguration in March, 1913. Four years later, Paul led a demonstration in front of the White House, again demanding women’s right to vote. Protesters were arrested for obstructing traffic and jailed. While in prison, Paul began a hunger strike drawing more attention to her cause. Responding to political pressure, President Woodrow Wilson called on Congress and the states to amend the Constitution and allow women the right to vote. The 19th amendment was ratified in 1920. Alice Paul was born in Mt. Laurel, New Jersey. Her parents were Quaker, and she was raised in that tradition. She received a BA from Swarthmore in 1905, and a MA in Sociology and PhD in Economics from the University of Pennsylvania. Although she attended a suffrage meeting with her mother while a young woman, it was not until she went to the United Kingdom in 1907 that she became fully involved in the cause. She was inspired by the more militant tactics of British suffragettes, which included chaining themselves to fences, smashing windows, and conducting hunger strikes. When she returned to the United States, she joined the National American Woman Suffrage Association (NAWSA) and was appointed Chairwoman of their Washington, DC, Congressional Committee. One of her first acts in this position was to organize the highly successful 1913 Woman Suffrage Parade. With a group of like-minded women, including Lucy Burns, Paul campaigned for a constitutional amendment to guarantee women’s suffrage rights. This group eventually split from NAWSA to form the National Woman’s Party, which used British-style tactics. Following the passage of the nineteenth amendment, Paul continued to fight for equal rights for women. She received a law degree from Washington College of Law at American University in 1922, as well as a Doctorate in Civil Laws in 1927. She drafted an early version of the Equal Rights Amendment, proposing it in 1923. For the rest of her life, Paul pushed for the ratification of that amendment. Although an ardent supporter of equal rights for women, Paul was not always an ally to other minorities. She was willing to to exclude African Americans from her campaigns in order to gain the support of white men and women for her goals.